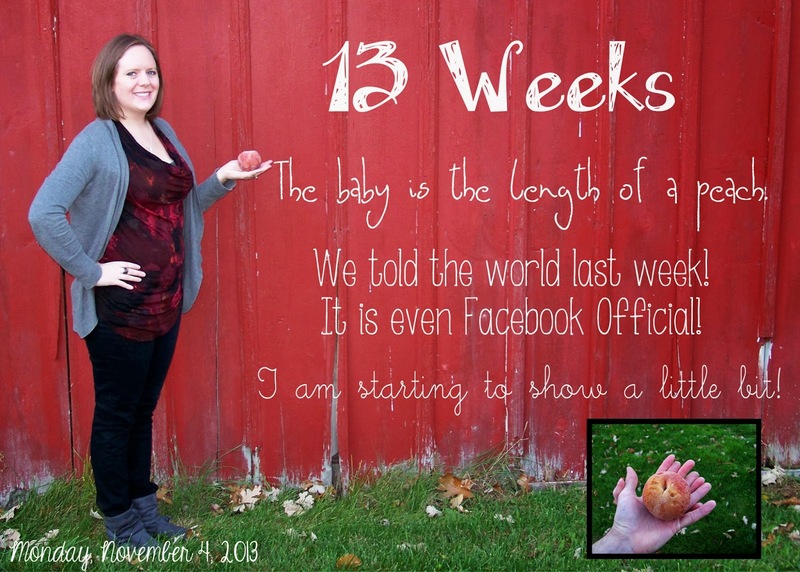 How big is the baby: The length of a peach-2.9 inches. It is not easy to find a peach in the fall. I luckily had a couple still in my freezer that I never used this summer! Weight gain: Seems like I am up 1 pound. Doctor/Medical Stuff: Won't go back to the doctor until November 25. I have had these two weird patches of dry skin on my left wrist. Pregnancy eczema? It doesn't itch though. Hmmmm. Clothes: Regular clothes as long as they are lower rise pants. Sleep: Have been sleeping OK, except for waking up 1-2 times for the bathroom. Food/Aversions: Getting in the routine of only eating a little at a time. All. Day. Long. I really really wanted french fries last night. But I got some today. I've also been making myself eat stupid fresh Kale every day. I just tell myself the baby appreciates it! What I miss: I definitely don't miss keeping it a secret! It is so fun everyone knows now! What I am looking forward to: Looking definitely pregnant and not like I just ate a few too many burritos for lunch. Oh! And This: Telling people last week was a blast! I told work on Tuesday. I told my friend the secretary by telling her I needed a sub May 12-15. After looking at me weird and writing it on a post-it, I explained it was because I was going to be on maternity leave! She was excited and couldn't believe I actually made her write it down. The other girls are work were super excited too! Wednesday we were SO anxious to talk to Mommom and Poppop. We called them a bit early and they opened their package we sent. They were SO excited! They did suspect that this might be the deal since we asked them to wait until we were on Facetime to open the package. It was so fun to tell them! We texted and emailed the rest of the family after that! Friday it was finally Facebook Official! We knew with so many people who knew, we couldn't keep it a secret much longer. People are so excited to celebrate with us! Nothing like a pregnancy announcement on Facebook to make a girl feel loved (70 comments and 145 likes!) I just posted our announcement picture and said, "Guess What?" This past weekend I had Girls' Weekend at my friend Angie's cabin. For the second time ever since 2006 I couldn't drink (when we went in June I was in the waiting phase of trying), but it was still as fun as ever! There were only 4 of us this time and Saturday night included getting locked out, but I laughed so hard I cried several times throughout the weekend!